A tow bar on a V7Sport? – 27 Nov 2017. All year I have been threatening to fit a tow bar to the V7Sport which generally has caused some amusement whenever it’s been mentioned. Nevertheless I did make a start on fabricating a hitch at the beginning of July. 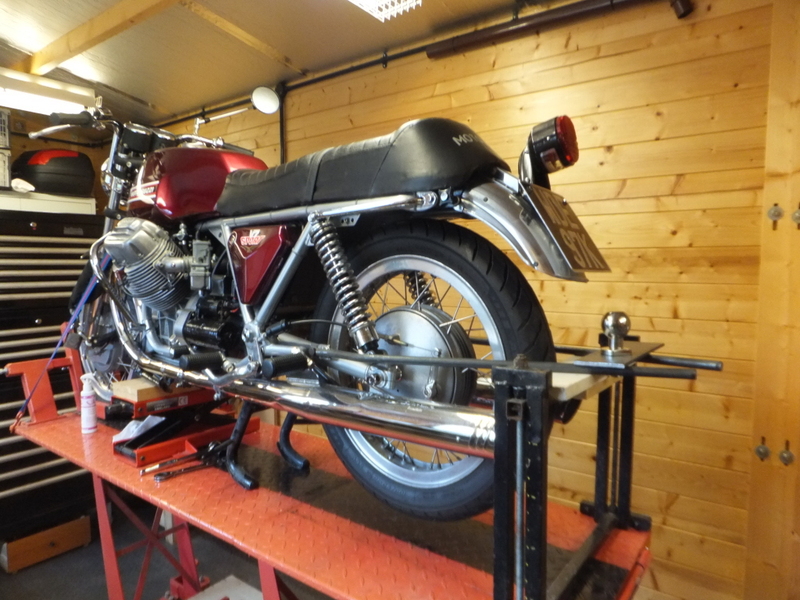 The plan had been to have it fitted and useable by the MGCGB Guzzi Festival in August but, what with one thing and another, I was nowhere near being ready and I went on The Fire Bike instead. I had been reluctant to post my progress as I went in case it all turned out wrong. However, today I’ve revisited the project and have decided to file a report as I can’t see why it shouldn’t work. Firstly, why would I want to do such a thing? 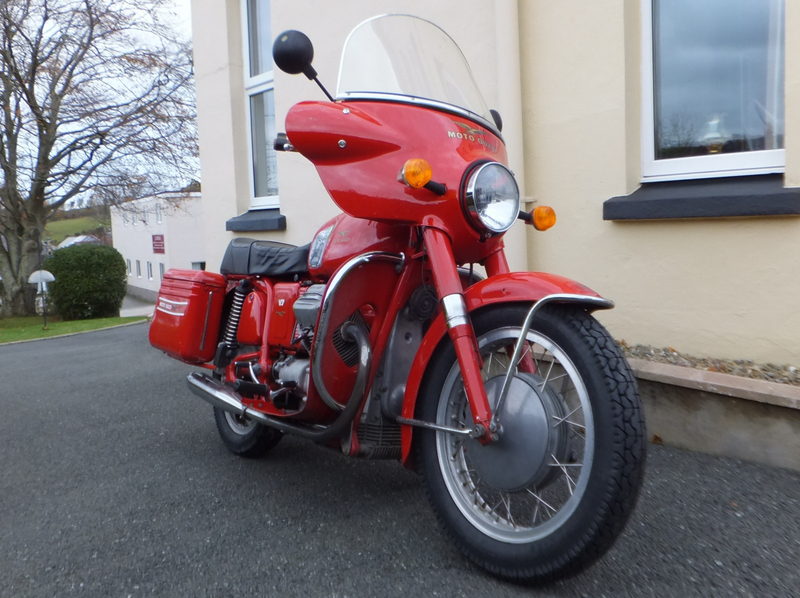 I enjoy attending camps and rallies and, having towed my trailer behind The Fire Bike, have found this to suit me. I can carry whatever I want for a comfortable weekend (without being too silly) and don’t have to crush everything to fit into panniers. My stuff stays dry and I can carry bulky but light items which I would usually have to leave at home. Now I will have a choice of bike to take on these jaunts. Next I had to come up with a design. I don’t mind the Fire Bike being permanently fitted with a hitch but I wanted something for Rhino that could easily be removed. 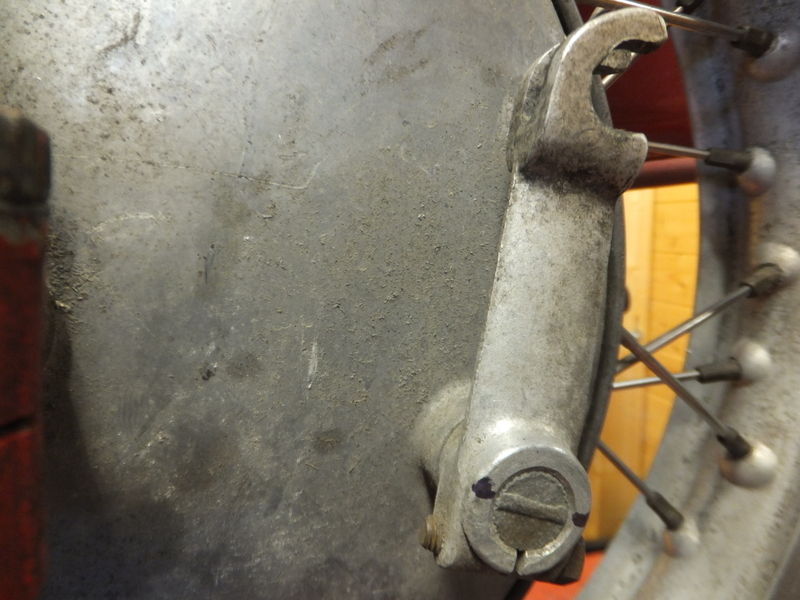 I’ve looked at tow hitches fitted to other Tonti framed Guzzis and found that there seem to be two main types. 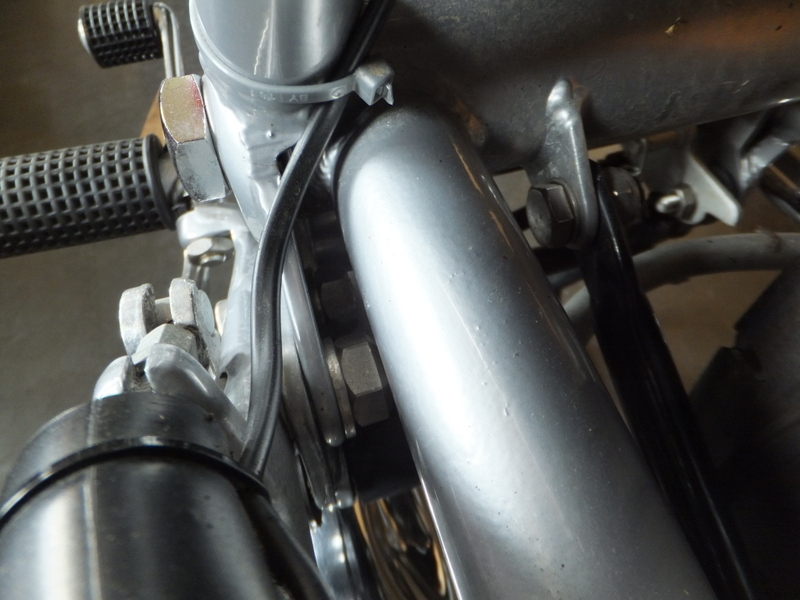 The first sort is bolted to the same bolts on each side that fasten the lower frame rails to the main bike frame. Tubes/bars then run back to the tow ball. This lot is then held up by stays to the rearmost part of the seat tubes where the seat pivots on a V7Sport. The second type of bracket is fastened to the upper part of the frame and then curves down in an S shape to the tow ball behind the wheel. 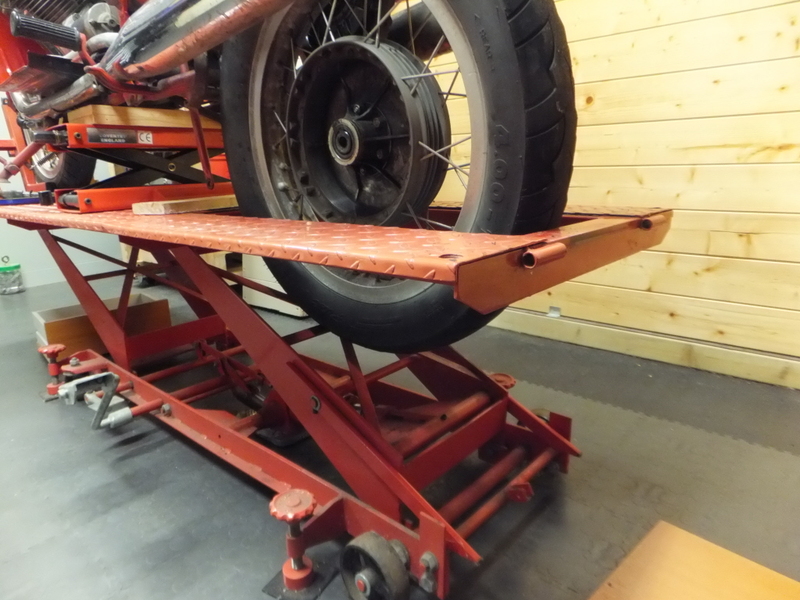 This is then stabilised by bars running forward to the footpegs. I decided to base my design on the first style. The first difficulty was that, on the V7Sport, things are very busy in this area on the left side due to the rear brake arrangements. 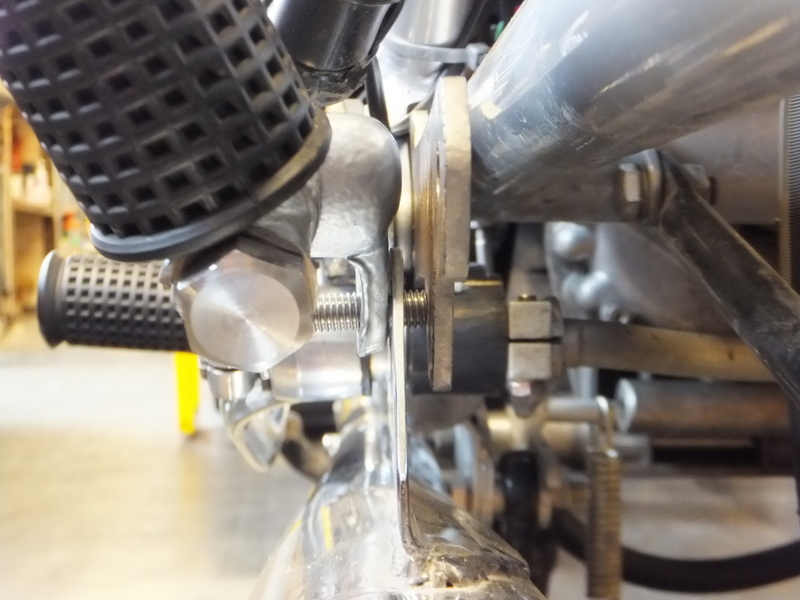 The brackets can’t be fitted on the outside of the frame joint because the brake pedal is there. On the inside there’s not much clearance between frame and swing arm. 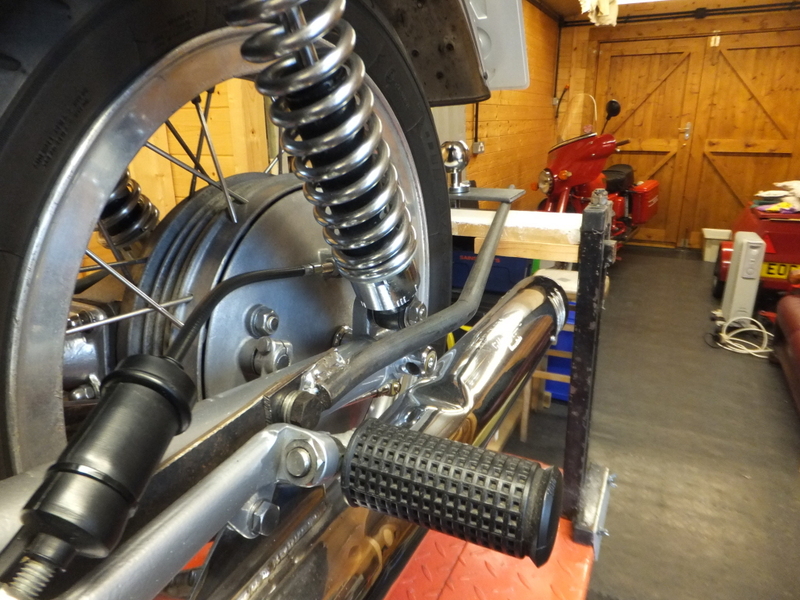 What I decided to do was to make a heavy metal bracket to connect to the two bolts and to the bolt on the footrest bracket that mounts the silencers. I could use this to then provide mounting points behind the pillion footrests and build the tow bar proper back from there. The flat brackets would be able to remain in place when the rest of the tow bar is removed. To this end I removed the footrest brackets and used them to mark out hardboard templates before cutting out the final version. It turned out that, due to the restricted space on the left side of the frame, I couldn’t quite do things as I had wanted. 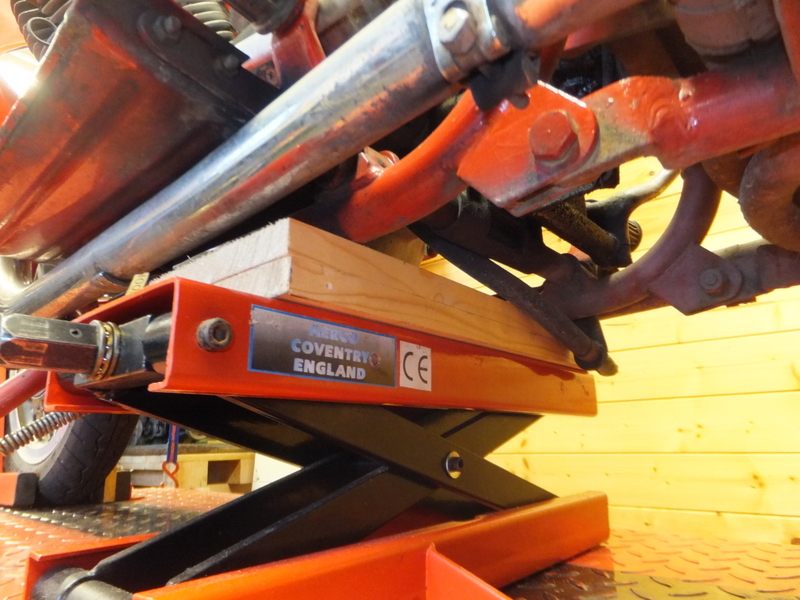 I found that I could mount the plate to the forward bolt in the pair but not the rearward one. 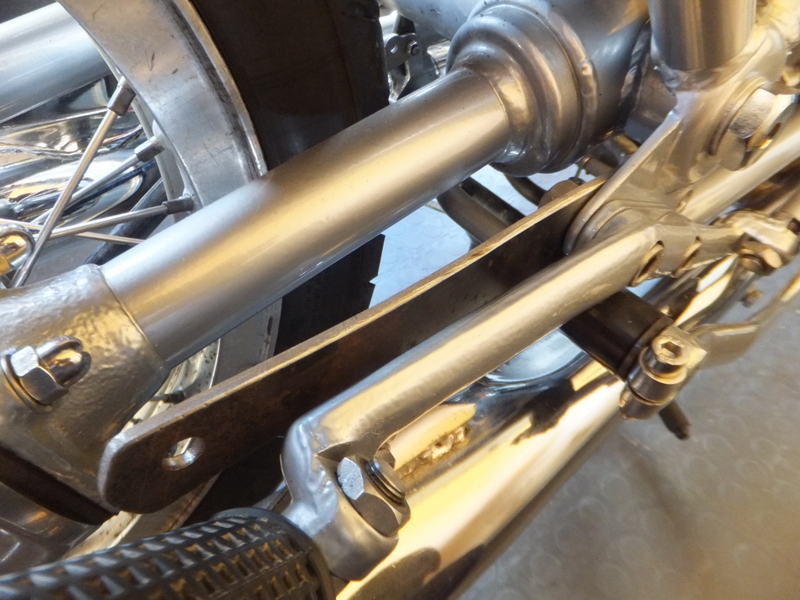 The nut on that bolt is already chamfered to gain clearance and the thickness of the plate would make it hit the swing arm. I did think about using a half thickness nut but realise this would have to be chamfered and I wouldn’t be able to get a spanner on it. I did make a smaller nut (17mm instead of 19mm) but it still didn’t really work. In the end I drilled a clearance hole and left that bolt alone. On that side the plate will be held by the one bolt here and the other where the exhaust mounts. The modified pattern is a slightly different shape to maintain strength. 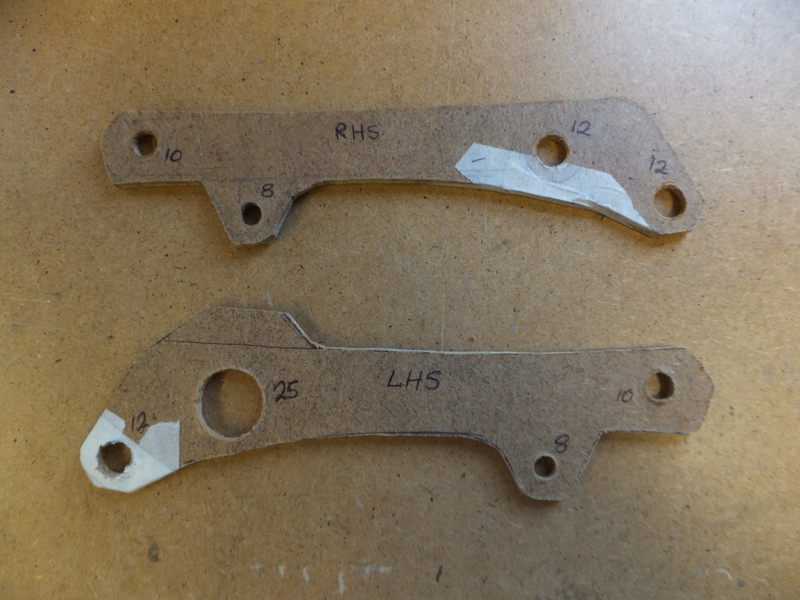 It was offered up before both metal plates were cut and fitted. I had to replace three of the frame bolts with slightly longer ones. 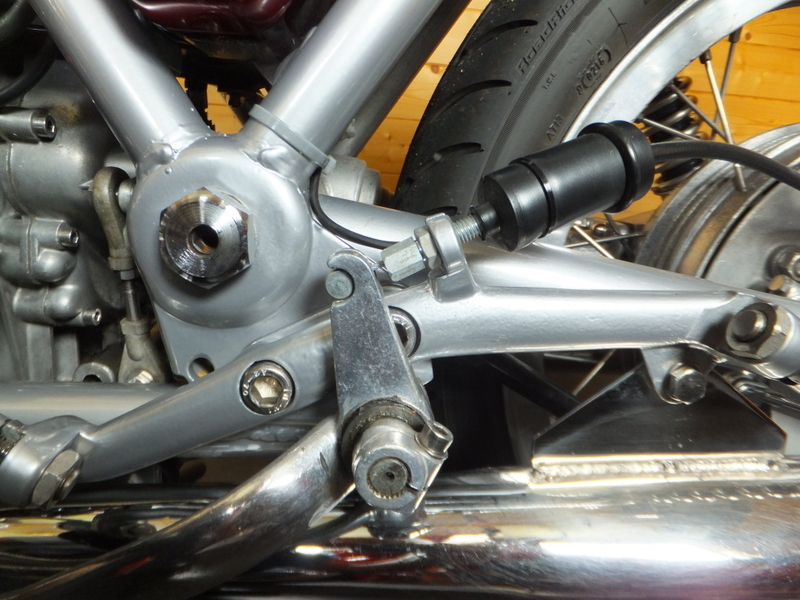 I had to cut some packing pieces to fit between each footrest bracket at the silencer bolt and my new plate. The two unpainted plates have been left on the bike since then and you’d only notice them if you went looking for them. I bought some solid steel bar from Eifion who made the tow bracket/pannier frame for my V7 loop. I got the same stuff as he had used. A lot of time was then spent measuring and working out how these bars should be bent. I made a template board up and then took it with the bars back to Eifion who bent them to fit. It would have taken me ages. He did it in 10 minutes. I did weld flat plates to the forward ends of the bars after cutting them to length but that’s as far as it went. I’ve not had time to do any more since the beginning of August. 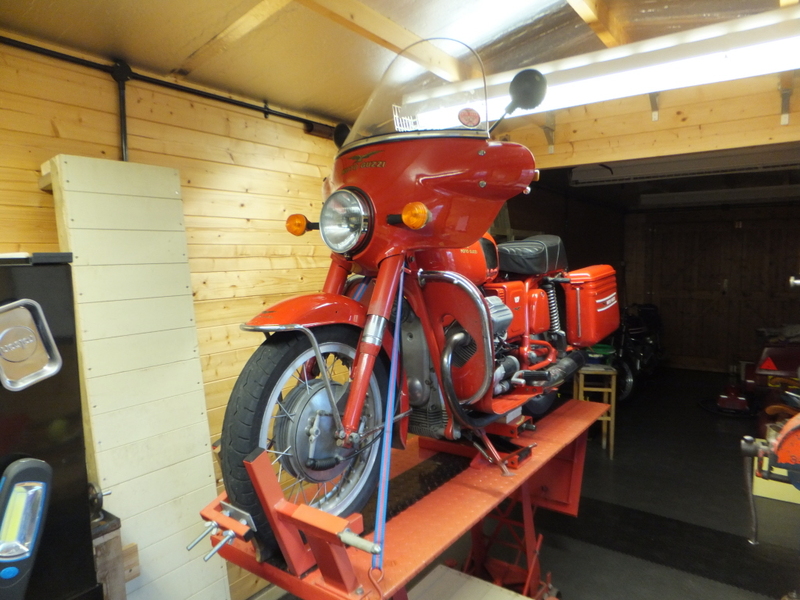 I’ve now got the bike up on the bench and the bars bolted to their brackets at the front end. 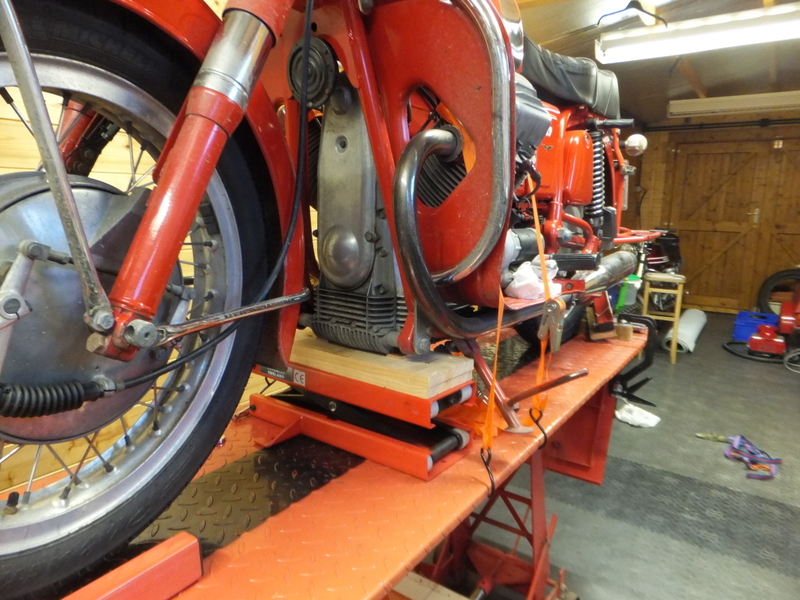 The rear section is positioned on my old home-made lift. 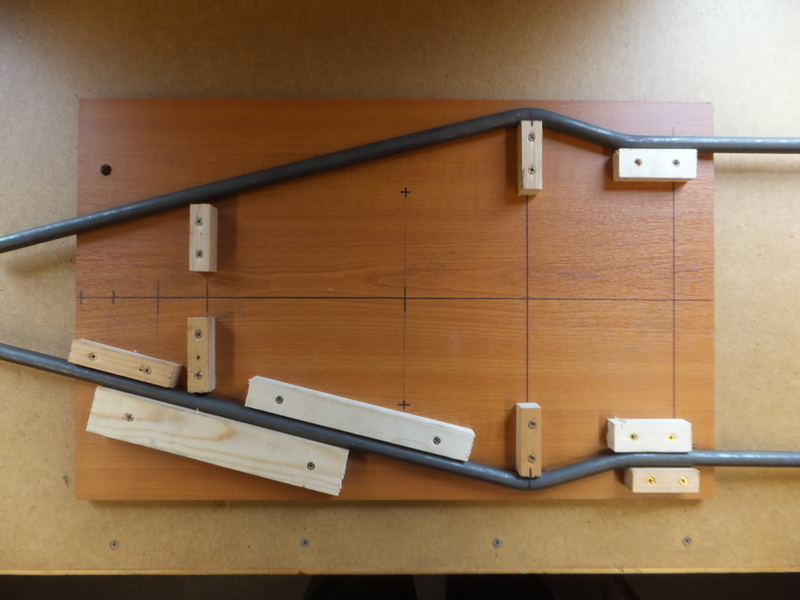 I constructed this about ten years ago to hold my old 750S3 when I put it together for the first time. It clamps to the edges of the bench and has a thread to raise the cross piece on each side. I had intended to cut it down as its height gets in the way sometimes. I’m glad I didn’t! V7 tyre fitting, part 2 – 16 Nov 2017. And so to the front wheel. I repositioned the support and tie-downs which always takes me a bit of time. I’ve seen photos of bikes which have taken a tumble from benches like mine. Once I was happy, I removed part of the bench wheel clamp, jacked up the front end and set about removing the wheel. It’s easy enough. I have to remove the mount I made for the push bike speedo sensor first. 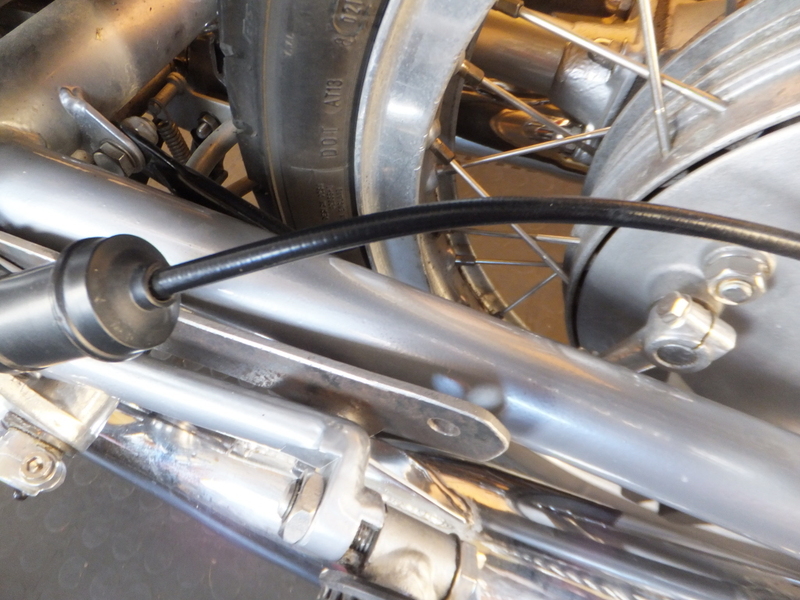 Then disconnect the brake cable and start by removing it from the handlebar lever first. 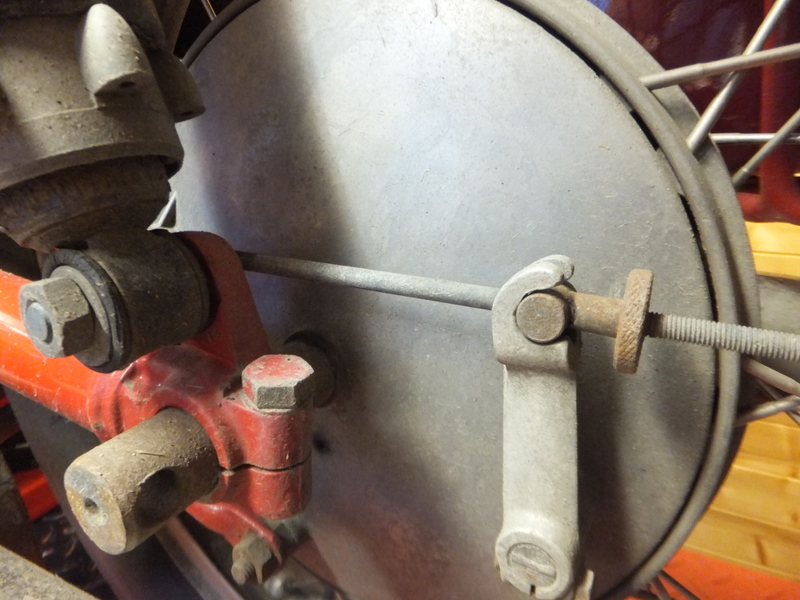 The other end can then be removed from the lever on the hub. 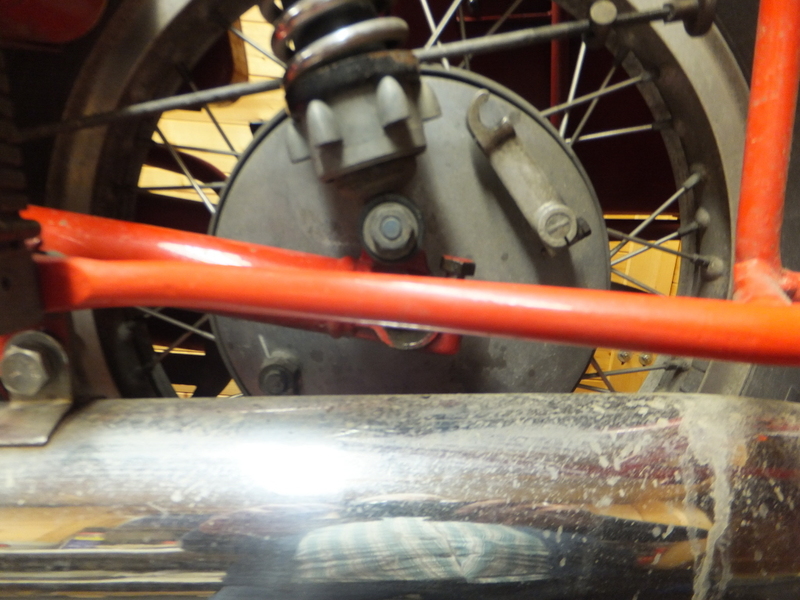 The spindle/axle nut is undone and the clamp bolts at the bottom of the forks are slackened off. The big old screwdriver is then employed to wiggle the wheel spindle out. Usually the hub cover plate drops out with a clang at this point as I forget it’ll do this. I had to raise the front of the bike a bit further before the wheel would drop out because there wasn’t quite enough room for the brake plate to clear its locating plate on the fork leg. Once it was out I went through the same performance as I did the other day to change the tyre. The old tyre was difficult. The new tyre was easy. 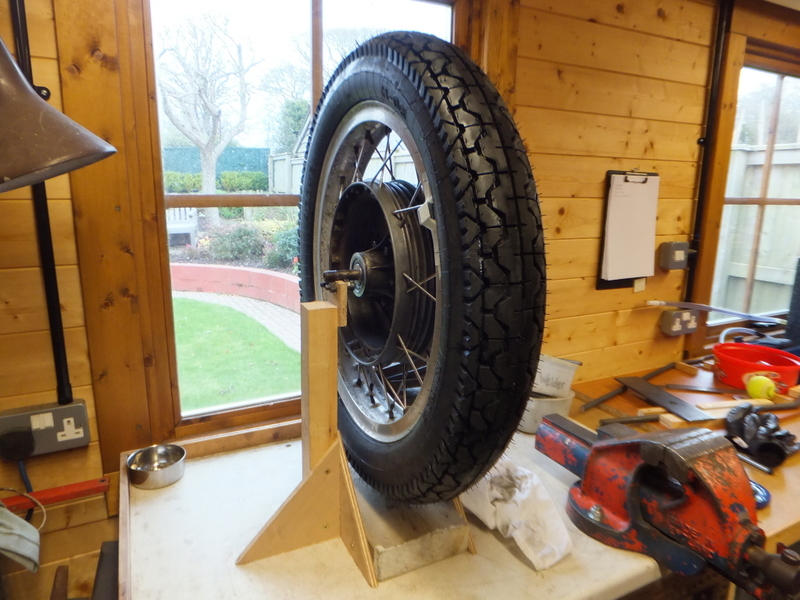 Here is the newly mounted tyre next to the old ‘un. The size difference is quite noticeable even though the widths are much the same. 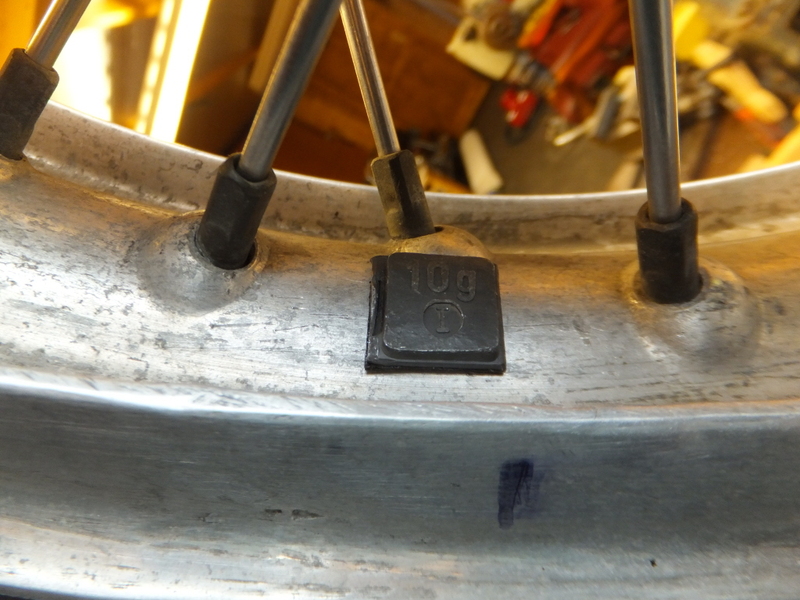 The 90% aspect ratio of the old tyre means its diameter is actually 20mm less than the new one. I balanced the wheel which only needed 10g. I reused a real lead weight using some good double-sided tape. I would like to use spoke weights rather than these stick-on ones. I’ve seen some for sale but want to get proper lead ones if I can. As they say in the manuals, “refitting is the reverse sequence to removal” (but you might swear in different places). Here’s the new tyre fitted. then turned my attention to another little job. Back in the summer, the loop securing the front brake cable to the mudguard broke and I just taped the loose bit up and out of the way. I needed to fabricate a new one which was surprisingly difficult. It will do until I can find something better. You can see in this photo where the cable has rubbed the paint of the edge of the mudguard. There was now the thorny issue of tyre pressures. 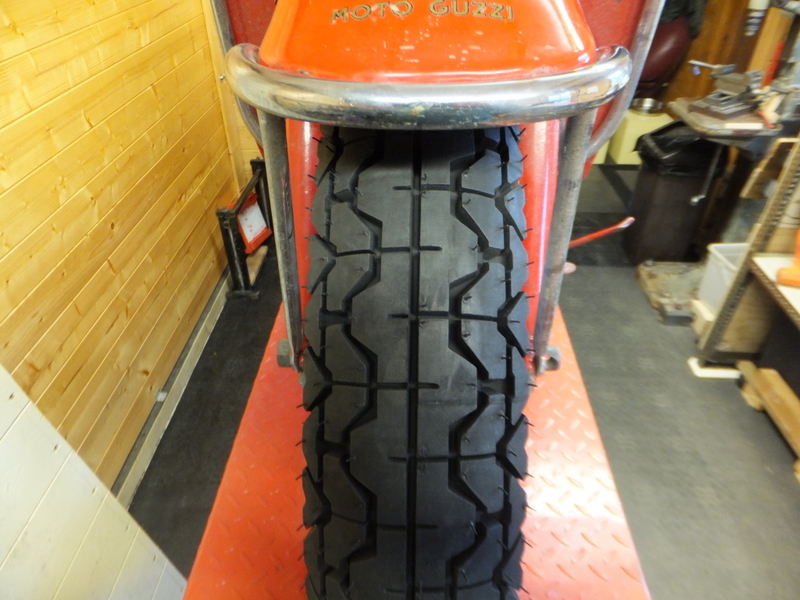 Originally Moto Guzzi specified 21psi in the front and 25 psi at the back for solo use with the rear to be increased to 28psi when carrying a pillion. The handbook also says to add about 3psi to the pressures if doing constant high speeds. I was running the previous tyres at higher pressures (32/36psi). I’d been told this was necessary with more modern tyres. In fact, some said this was still on the low side. The issue I now have is that the maximum pressure for the new Mitas tyres is 33psi. 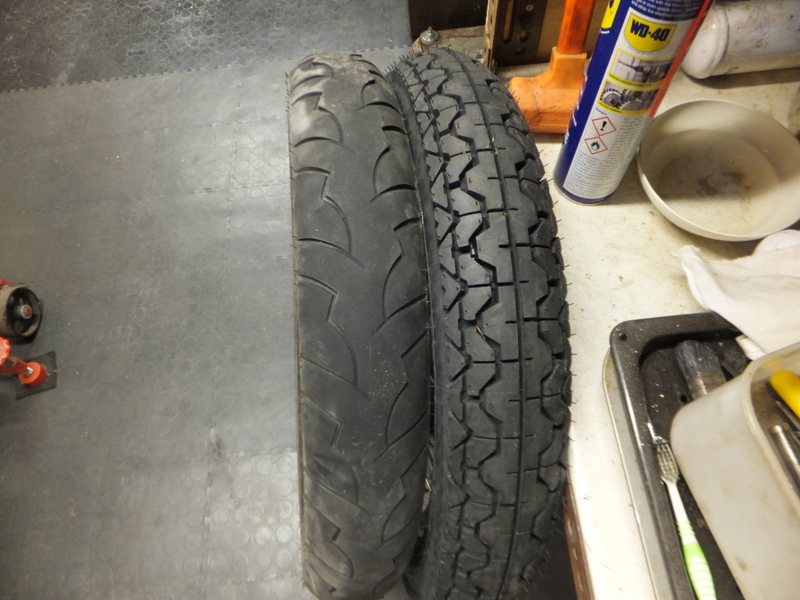 The old Michelin rear tyre had the same load rating but carried it at 41psi. Even so, the original “book” pressures still seem very low to me so, in the absence of anything else, I’ve gone with 24/28psi as a starting point – the “book” high speed/motorway pressures. I’ll see how it goes and might contact Mitas UK to see if they have any thoughts. Here’s the fire bike ready for a run to scrub the tyres a bit. It was dry if a little cold. It was only a dry test but, so far so good. I can notice a slight change in that the steering seems heavier at very low speeds, say under 10mph. Once rolling traction and grip seem more than adequate and the handling just as it was before. I doubt I’ll have to wait long for the chance to test wet weather performance! Oh, one thing. 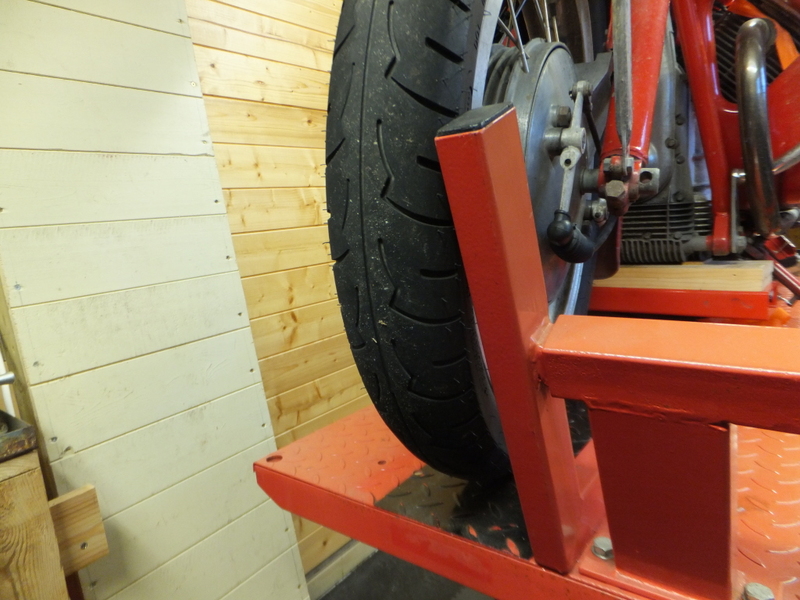 The increase in front tyre size has made all the difference when putting the bike on the centre stand. I’d been finding this hard going to the extent that I avoided it. Now I think about it, the side stand didn’t ground when I took the bike off the bench like it had when I rolled it up there. The annoying squeak from the front suspension is back but I know what the cause is. It’s the front brake cable rubbing as it passes through the support loop and grommet! Once back in the garage there was one last thing. 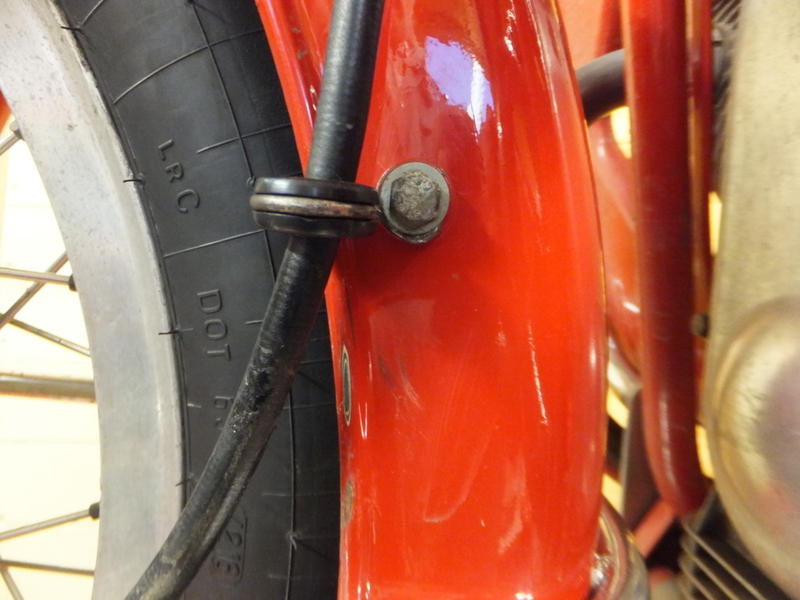 I recalibrated the push-bike speedo for the new tyre size and fitted a new magnet. I’d knocked the old one off during the tyre change. It got a bit messy as I had to cut the tube of Stixall open to find the last useable drop! 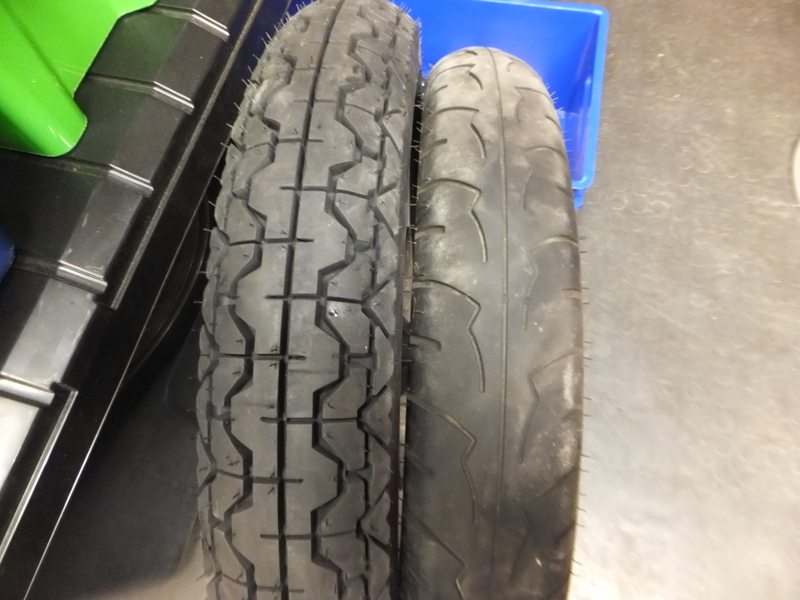 V7 tyre fitting, part 1 – 13 Nov 2017. I got my tyres after some unnecessary shenanigans. I was let down by the first suppler who accepted my money then contacted me a day later to say the tyres weren’t in stock so they were going to give me a credit. I checked their website and, lo and behold, the tyres were still listed but had gone up in price. I considered this to be sharp practice and told them so. It meant that I could actually get the tyres elsewhere for less than their new price so, that’s what I did and insisted on a refund. I wasn’t bothered by a 4-day delivery time. It took 2 days for the original company’s accounts department to process the refund which then took several days to reach my account. To top it off they asked for my feedback on resolving the issue before I’d even got my money back. I told them what I thought again. Oh, and I promised I’d give them a mention here so, Pneus Online you get a definite thumbs down from me. Now I’ve got that off my chest let’s get back to the task in hand. As the rear tyre was pretty near bald I decided to tackle that one first. 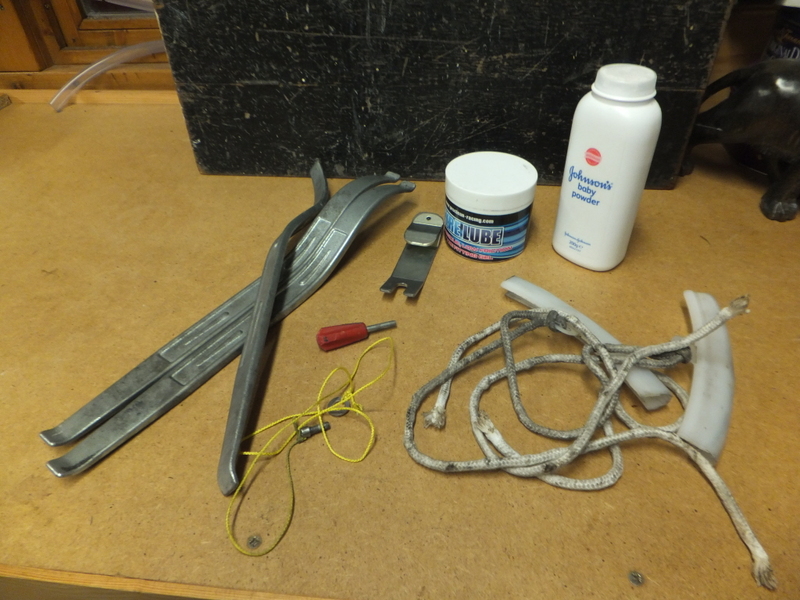 Here’s my tyre changing kit. Tyre levers, bead buddy, valve core remover, rim protectors, tyre lubricant and powder to stop the tube sticking to the tyre. The thing with the yellow string is a home made tool that screws into the valve stem to pull it through the rim. I’ll buy the proper job when I see one. Also on hand was the garden spade. More of that later. I’m not going through the process of changing a tyre as there are plenty of helpful videos on you tube. 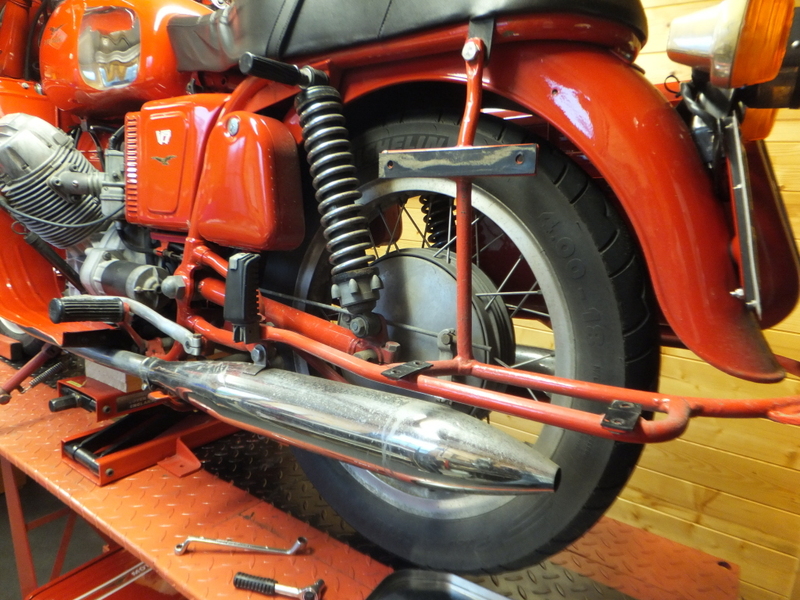 This time I’m going to try and get the rear wheel out without having to remove the exhaust. 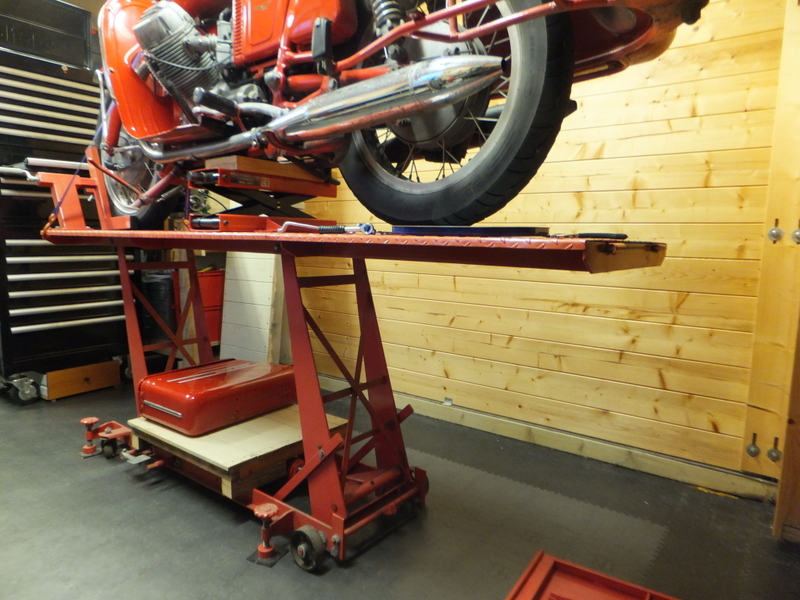 I’m lucky in having a lifting bench with a trap door which should allow the rear wheel to be dropped clear. I managed to get the bike secure on the bench without having to call for assistance. 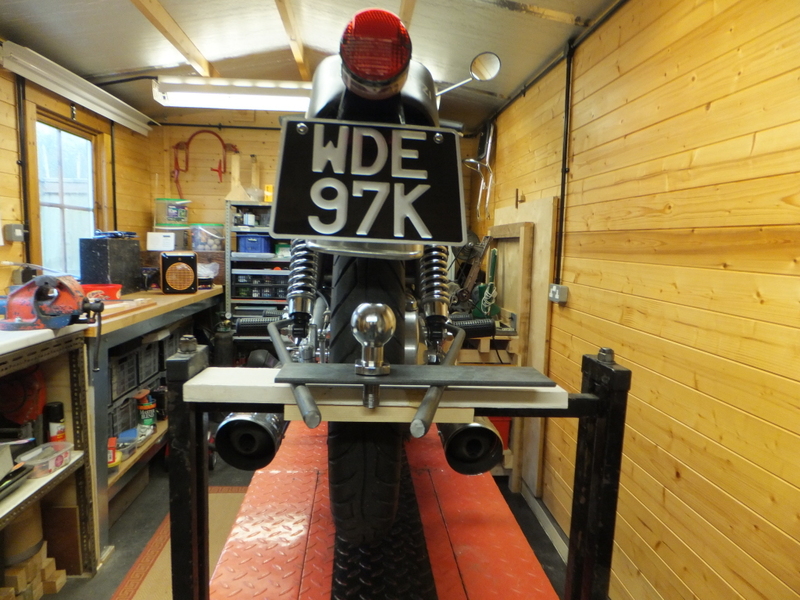 Ground clearance was an issue when I wheeled the bike onto the bench. 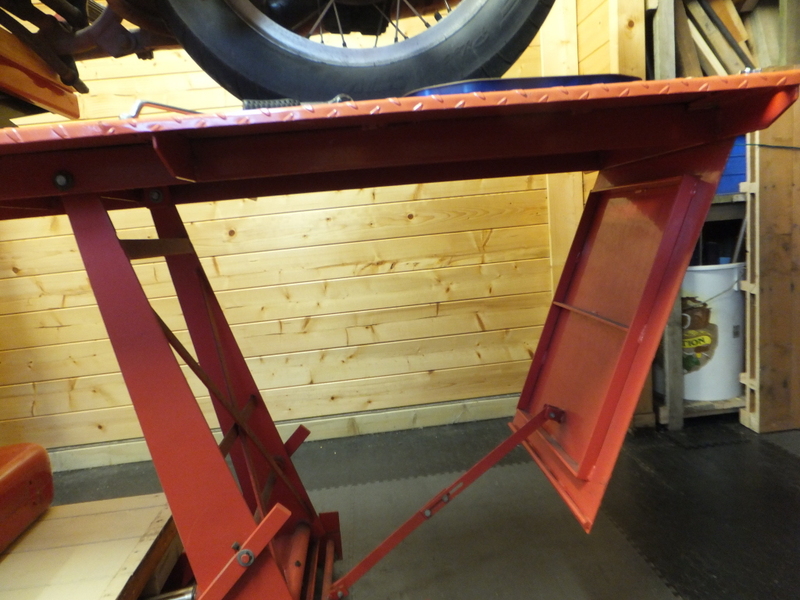 The “washer” welded to the side stand caught on the bench top as it went over the crest. 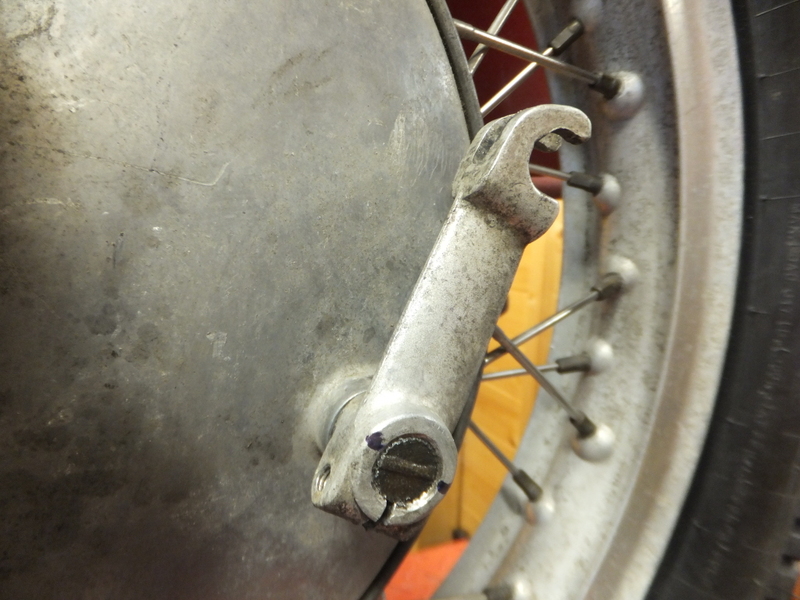 The one thing I did take off was the left hand pannier to give me access to the brake rod etc. 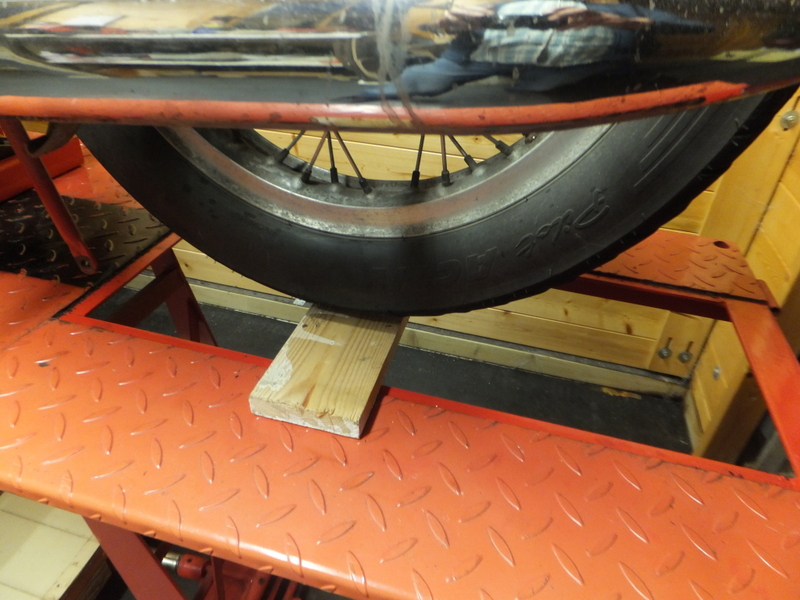 You can see here that, if I want to drop the wheel completely through the hole in the workbench, the ramp will get in the way. That ramp was soon off. Now to actually get that wheel off. I’m sure I’ve described this before but never mind. 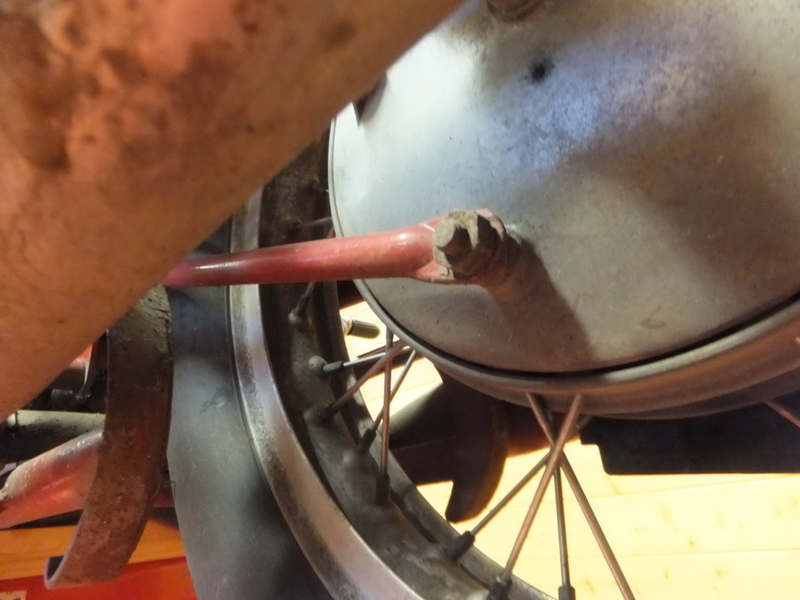 First thing is to disconnect the brake pull rod from the brake hub by undoing the knurled adjuster. Then the brake torque arm has to be disconnected as well by removing this nut. 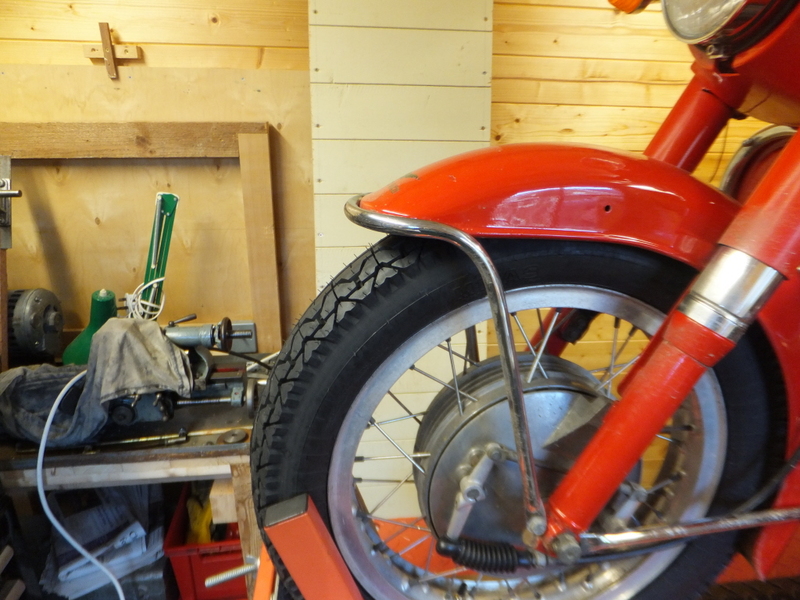 The fixing at the other end to the swing arm has to be slackened as well before it will come off and that end is difficult to get at with a non-flexible wrist like mine. 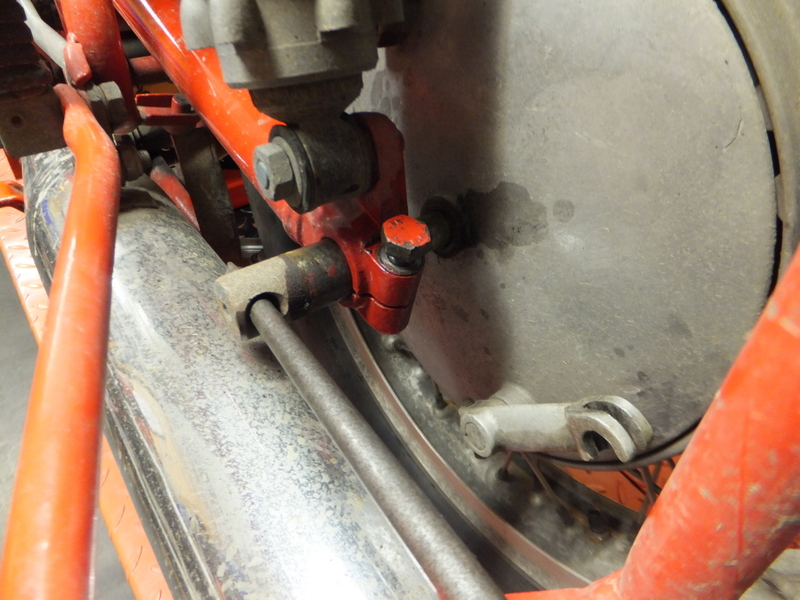 I then remove the spindle/axle securing nut before undoing the clamp bolt on the swing arm shown here. I use a big old screwdriver to get everything moving. Before pulling the spindle out I removed the plate from the bench but put a bit of timber across the gap until I was ready just in case. 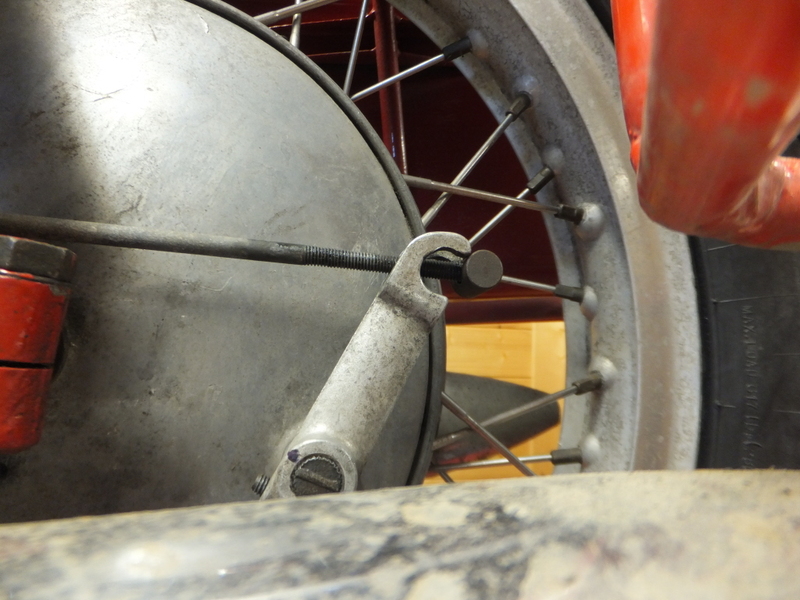 The spindle now comes out but I hold the wheel and brake hub against the drive box while turning the brake plate so that no nuts can catch when I pull the wheel toward me off the splines to lower it away from the bike. The actual changing of the tyre was interesting! It was an absolute fight to get the old Michelin tyre off. Breaking the beads was easy enough. I did it the way I always have using the garden spade and jumping on it! After that I spent ages. I could get the first bead over the rim but the second one didn’t want to play. In the end I took both beads off so the wheel fell down inside the tyre. I then had to rip the wheel out from the middle which took all my strength. However I did it without causing any damage to the rim or me. I wasn’t pleased to find that the new tube I had given the tyre fitter (I wasn’t able to do the job myself following my broken wrist) had 2 patches on it. He’d obviously had some issues then! I cleaned up the rim and fitted my new tyre. How easy was that? Only one lever was needed to get the first bead on and two for the second one. 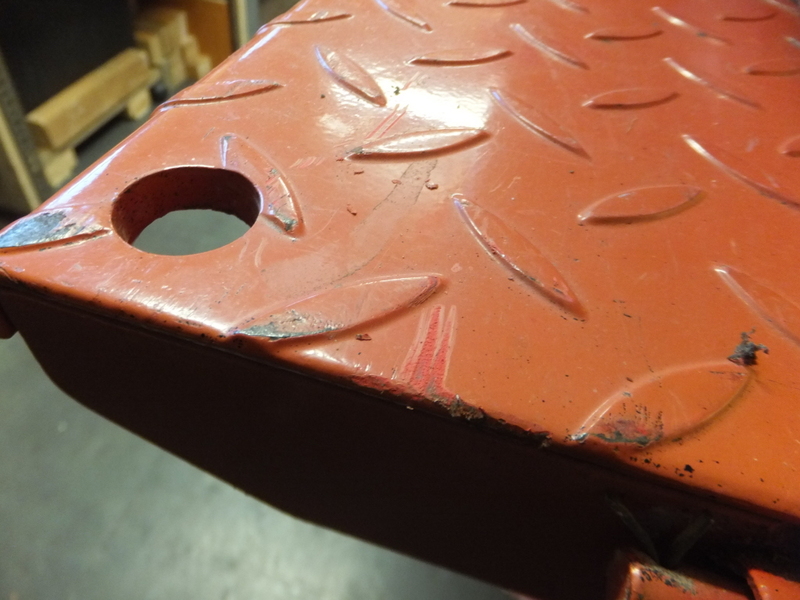 There was no heavy levering needed and it was safe to dispense with the rim protectors. Perhaps it’s because these are tube type tyres and the old ones were tubeless but used with tubes. I don’t know but, this is how I remember it used to be. I got my home made tyre balancer out and was pleased to find I only needed 30g of weights. The old tyre had a lot more than that. Here are old and new. The new tyre looks a bit wider but isn’t. It’s just because that one’s mounted on the wheel. 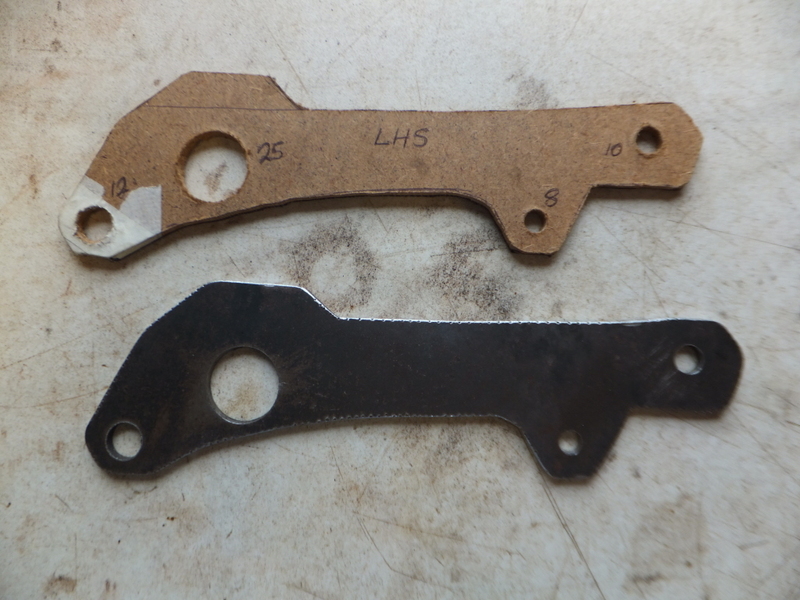 While the brake plate was off I checked the linings. They are still good (4mm). I had begun to wonder because I had run out of adjustment on the brake pull rod. Much to my surprise getting the wheel and brake plate back on the bike was easy enough. 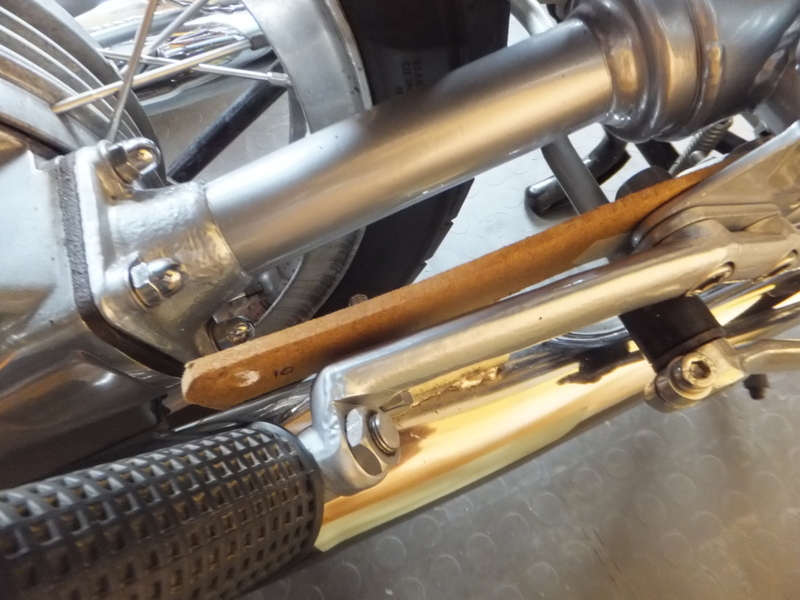 I was able to stand behind the bike, reach through the bench and lift the wheel up so I could shove that bit of wood under again. Maybe I could use this technique to get the wheel out next time. So with the wheel back on the drive splines the wheel spindle was put back in place. 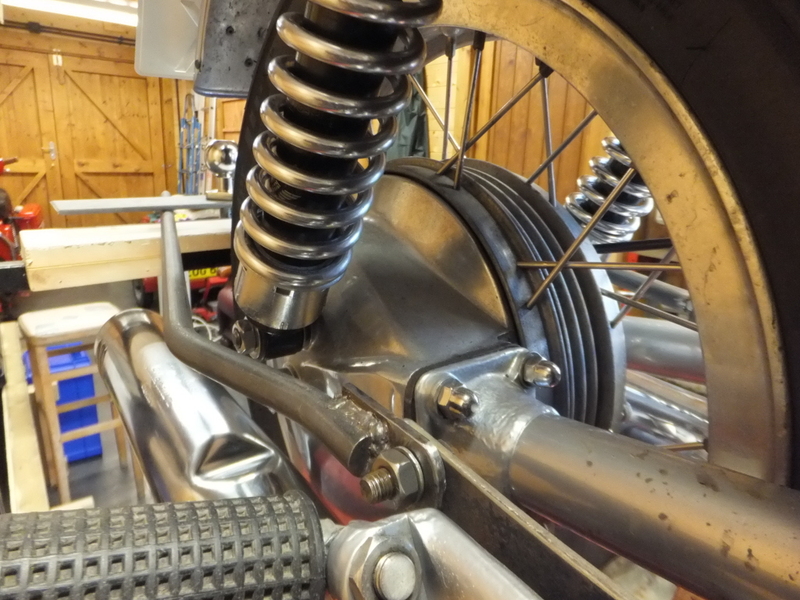 The brake torque arm needs to go back on before tightening the spindle nut, then the clamp bolt on the swing arm. 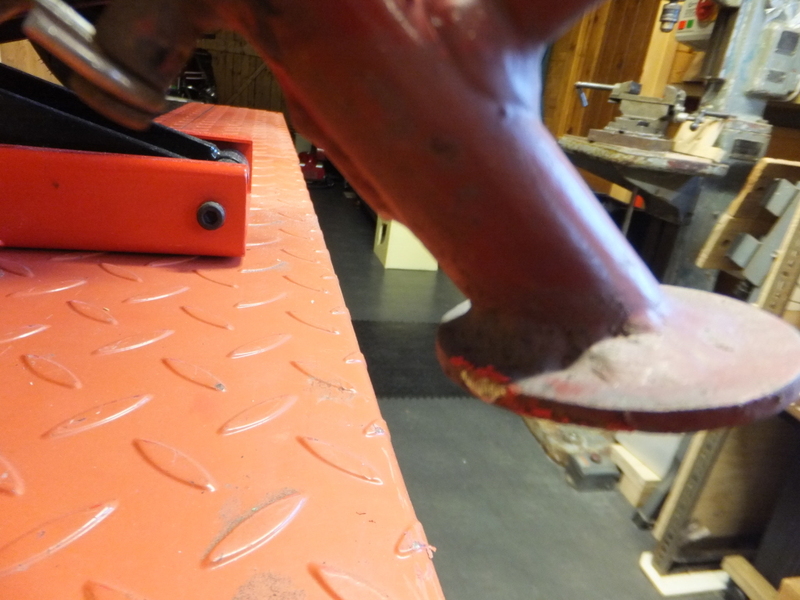 As I’d run out of brake adjustment I decide to move the lever on the brake plate. I marked it’s current position before removing. Then I refitted it turned one spline. The brake rod was then refitted but to do this I had to lever the arm round a bit first so that I could get everything properly located. Now I was able to adjust the brake to give about 10mm free play at the pedal and with the bike back together I reassembled my bench. Front wheel next time. That’ll be easier, right?